Transportation is the backbone of global trade, and traffickers of wild animals and wildlife products rely heavily on the efficiency of air travel and cargo carriers to smuggle illicit goods. Companies from the transportation and logistics sector can play a critical role in identifying and strengthening key risk points in the supply chain. What is wildlife trafficking and how does it affect the transport industry? Wildlife trafficking is the illegal movement of wildlife and wildlife parts or products across borders. Estimated to be worth between $7 to $23 USD billion a year1, wildlife trafficking has become one of the most prominent forms of international crime globally, comparable—and sometimes linked—to the trafficking of other illicit goods, such as drugs and weapons. Wildlife trafficking is a transport-intensive activity. Traffickers smuggle illegal wildlife aboard passenger flights, hide wildlife in cargo loaded onto planes and ships, and send illegal wildlife products around the world. 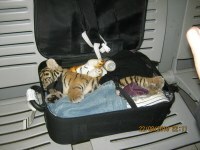 Each successful smuggling attempt puts the transport sector at risk of a) reputational risk from negative press and negative reports; b) legal risk of liabilities from lacking due diligence; c) business and operational risk when legal and safety issues result in financial loss, and; d) health and safety risks since trafficked wildlife can carry diseases, or be poisonous or dangerous. Why is wildlife targeted for illegal trade? Illegal pet (or collection) trade: An array of live animals, eggs, and taxidermy are targeted by buyers worldwide for private collections and zoos or as exotic pets. Examples include reptiles, such as chameleons and tortoises; birds, such as parrots and falcons; and mammals, such as tiger cubs and apes. Medicine, decoration, and status symbols: Wildlife products are purchased illegally for their aesthetic, social and medicinal value. Prominent examples include: elephant ivory, which is used for decorative items such as statues and jewelry, and is highly valued in parts of Asia as a status symbol; rhino horn and pangolin scales, which are used in parts of Asia for traditional medicines; and mammal furs and reptile skins, which are sold illegally for fashion or decorative items. Food: Live animals (such as turtles, tortoises, and lizards) as well as processed, dried, and frozen meat (abalone and pangolin, for example) are commonly trafficked into food markets for consumption. What are the impacts of the illegal wildlife trade? Wildlife trafficking is a global epidemic, affecting communities and wildlife populations in every region of the world. Often run by organized international criminal networks, the illegal wildlife trade has been linked to other illicit activities, such as human and drug trafficking, with the profits being used for all manner of criminal activity. Unabated, illegal wildlife trade threatens to wipe out some of the world’s most iconic species in our lifetime. However, wildlife trafficking is not just a conservation issue, nor a wildlife issue, nor a health issue: it is also a business and governance issue. In Africa, the current elephant poaching crisis costs African countries around USD $25 million annually in lost tourism revenue13. Last year, more than 100 wildlife rangers died on the job in Asia and central Africa, with nearly half killed by poachers14. Widespread wildlife trafficking also indicates the presence of organized crime and often corruption. Supply chains susceptible to wildlife trafficking could be exploited more easily by other forms of trafficking, including human trafficking and narcotics. As counter-trafficking governance and regulation tighten in every region, the risk of legal liabilities increases for companies that fall behind the rest of the industry in taking action.